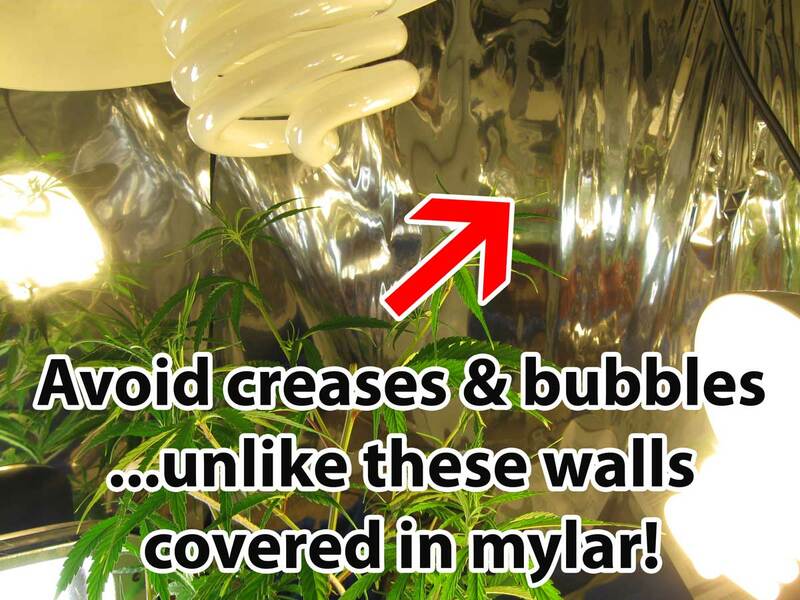 Light Reflectivity in the Cannabis Grow Room – Make the Most of Your Grow Lights! It's important for any grower who is cultivating cannabis indoors to maximize on the power of their grow lights. Indoor cannabis grow lights have gotten insanely bright over the years and this has enabled growers to provide their plants with an abundance of light. However, you can make your grow lights seem even brighter and more powerful without actually increasing the amount of electricity you use. 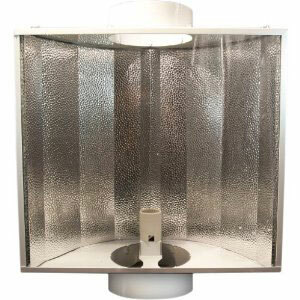 Proper reflection of the walls near your cannabis plants, and a great hood/reflector will bounce the light from your indoor grow lights back at your plants instead of letting all the light that hits the sides be absorbed. In fact, proper reflection can get up to 30% more light to your cannabis plants! This is all without changing anything else about your setup. No extra electricity, just 30% more light! As you probably know, light is what cannabis (and most plants) use to make energy and light is what powers the growth of your buds. It's important to understand that indoor cannabis grow lights are most effective when you get as much of the light they produce to your plants as possible. 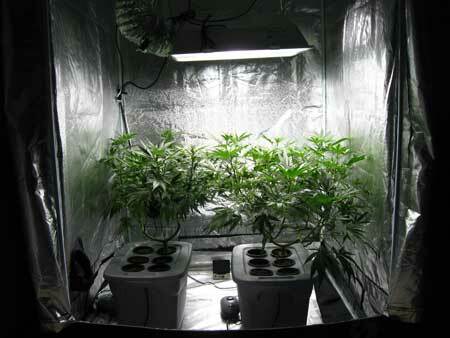 The further light has to travel to your cannabis plants, the more light that gets “lost” on the way. By making sure light is reflected back at your plants, your plants get to use even more of the light that gets produced which would normally be "lost". Reflective walls will also help prevent parts of your plants from sitting in a dark or shadowy spots. Outdoors, growers get to use the sun! 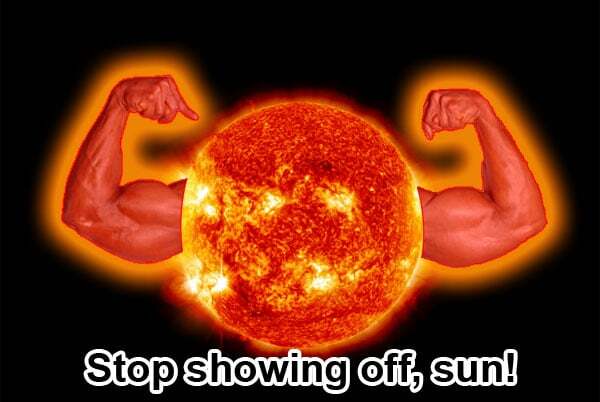 The sun is almost 93 million miles away, but it produces so much light that very little light is lost over small distances. That means reflectivity isn't important when growing outdoors in direct sunlight; the sun already gives your plants all the light they need! Unlike growing outside, reflectivity is important to get the biggest yields indoors! More light = faster growth & bigger yields! …but only up to a certain point! Today I will guide you through the most effective ways to get more light to your cannabis via reflection! Your plants will get more light if they are in a contained space with reflective walls compared to plants sitting in the middle of an open room, even if the walls of the room are reflective. This is because the amount of usable light a wall can reflect to a plant diminishes as the wall gets further away. This is partly why grow tents and grow boxes are so effective – in addition to helping you provide the perfect environment to your plants, they help contain the light so your plants get more of it! Hammered style texture provides some of the best reflection because of the angles at which it reflects light and it cuts down on hot spots. 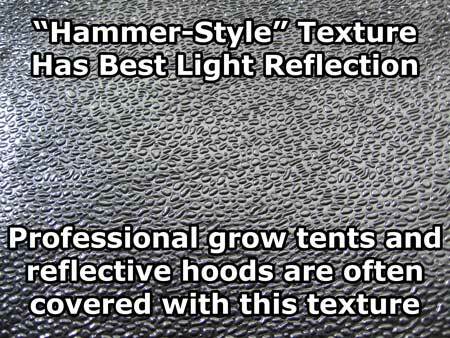 Most professionally made grow tents have a hammered style reflective material on the wall. This hammered finish is also what you find in high-quality light reflectors. 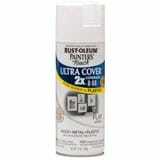 Reflective material is not dirty or discolored – keep your walls clean! Note: When covering the walls with something that comes in a flat roll like mylar or foylon, make sure the material is placed flat against the wall to avoid air bubbles which can create hot spots and reduce reflectivity. Velcro is a great way to place up reflective materials with minimal creasing or tearing. 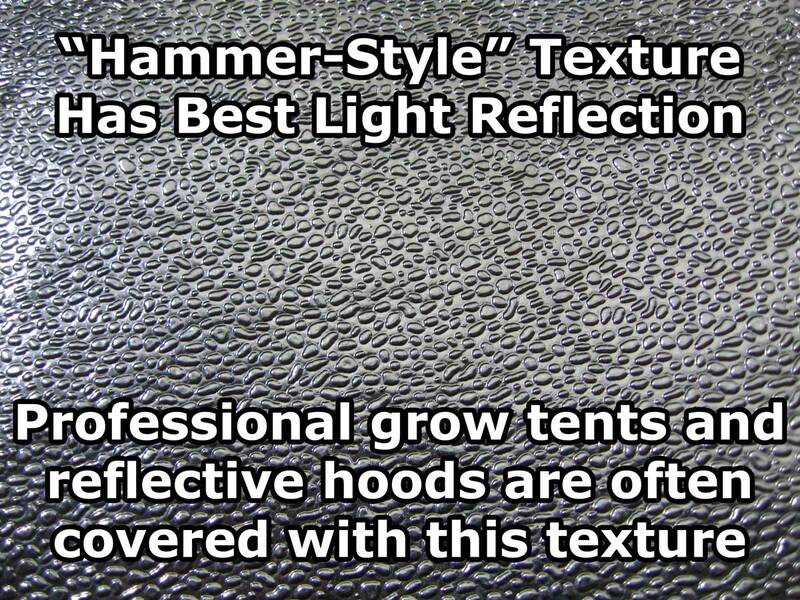 The BEST reflection comes from "hammer style" texture, like the walls of professional grow tents and light reflectors. We'll go into detail about other options, but if you're looking for the straight up answer, there it is! Different reflectivity options vary in their efficiency. It's also important to find a solution that fits your personal setup and budget. I will cover some of the most popular options – along with the pros and cons of each one – to help you pick the right option for your cannabis grow room. Getting a grow tent will give hobbyist cannabis growers probably the best light reflectivity of any option. Grow tent walls are easy to clean, light proof, water resistant, won't melt (like some plastics) and most grow tents are created with built-in cooling options. When it comes to growing personal amounts of cannabis indoors, grow tents are one of the best options for your grow area “walls” as they have been designed over several decades to create the best indoor grow environment for your plants. Grow tents can be found in many sizes, and generally will give you the best results for your money. After I got my first grow tent, I realized I could never go back to growing in anything else! This is a highly recommended option for those who can't invest in a grow tent or for the crafty DIY grower who opts to build a grow cabinet (or a whole room). Excluding the hammered style texture you see in grow tents, this paint will give you some of the best "bang for your buck" of any reflection option. Flat white paint is inexpensive, effective, and there's no way to create air pockets or hot spots behind the reflective material. Just paint the walls, let them dry, and you're done! White paint absorbs a lot of heat without reflecting it back into the room (which would require more venting to keep heat down) and painted walls are easy to clean. Do not get glossy paint even though it seems like it would be more reflective – you want flat (called 'matte') white paint for the greatest reflectivity. If you have the option, you can paint the ceiling and/or floor for even greater reflectivity. Sometimes paint containers will list the reflectivity, and the more reflectivity, the better. Panda plastic (also known as "Black and White Polymer") gets its name from being white on one side and black on the other. Although it can be a bit expensive, panda plastic provides great light reflectivity. You point the white side towards the lights, and the black side will help trap light from getting in or out. Panda plastic can be nailed or otherwise attached (velcro works great) to your walls and is easily taken down. The thicker the panda plastic, the more durable it is. Remember, this is made of plastic, so it can melt if it gets too hot – be careful to never let Panda Plastic sit too close to your lights! 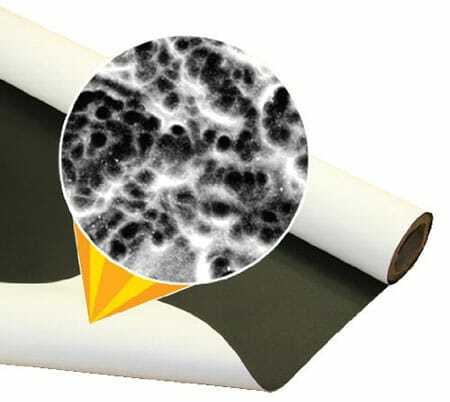 Orca grow film is made of white plastic microfiber and uses a unique structure that is similar to snowflakes or the skin of orcas (killer whales) to scatter light. Although expensive (even more so than panda film), Orca grow film is mold-resistant, easy to clean and thick – these features make it more durable and less likely to tear compared to some other reflectivity options. Using a highly reflective crystalline structure, Orca grow film evenly distributes reflected light so it doesn’t tend to create hot spots even when it has some creases. Orca film is used like panda film in that you point the white side at your plants with the black side facing outwards. Orca grow film tends to reflect back infrared light as well, which means it will tend to keep heat inside the grow room. Good for areas where the temperature gets low. This is another option than can be quite expensive though it gets the job done. 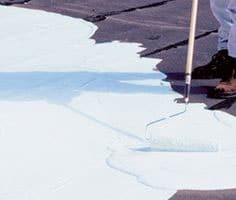 White elastomeric roof coating is a great option for some growers; it's made of 100% acrylic elastomeric resin and sticks to almost any surface. Once dried, it forms a thick blanket of mold-resistant protection that expands and contracts like rubber and will tend to keep heat inside the grow area (good for cold regions) and it even helps absorb sound. The biggest drawback to this method is the cost. 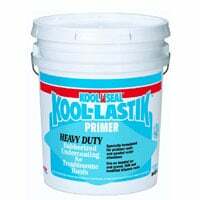 It's recommended that you use a primer like Kool Seal Kool Lastik Primer in order to make sure the coating sticks properly to your walls, however, this only makes the price that much more unappealing. Mylar is an inexpensive reflective material that looks shiny and usually comes in sheets or rolls. 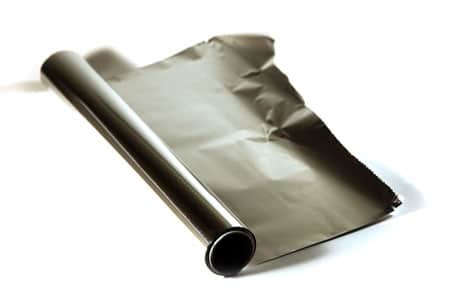 "Foylon" is a more durable version of mylar and "C3 anti-detection film" is an infrared-proof version of mylar (which means it contains more heat). Mylar generally is offered in 1mm or 2mm thickness – the thicker the mylar, the more durable it tends to be (resistant to tearing or creasing). 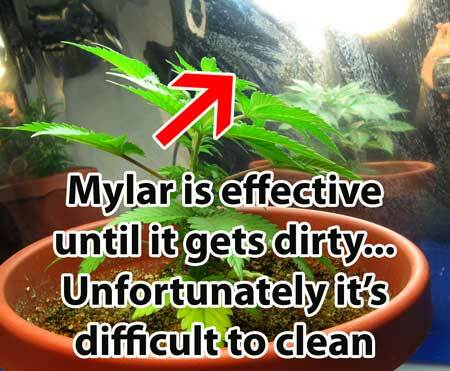 Mylar can be difficult to clean and may need to be replaced after a few grows. It is not light-proof, but does help contain heat in the grow room, so it’s important you create a good ventilation system to get rid of all the extra heat that’s being contained in the grow area. If there are creases, tears, or the film gets dirty, the light reflectivity is dramatically reduced, so make sure it's placed flat on the walls and kept clean. White poster board is inexpensive and readily available. Some growers will use it around the edges of the grow room, as well as for the floor and ceiling. While it is reflective when new, white poster board is difficult to clean and gets soft and/or moldy if it gets wet. Aluminum foil (also known as tin foil) is often used in the kitchen, and many growers will see that it's shiny and deduce that it may be a good option to reflect light back at your cannabis plants. Despite what seems intuitive, the dull side of aluminum foil actually reflects light better than the shiny side. Unfortunately, one of the problems with aluminum foil is that it’s extremely easy to crease, and any uneven creasing can dramatically reduce the reflectivity. In fact, anyone who has used aluminum foil knows that it's a challenge to not crease it! 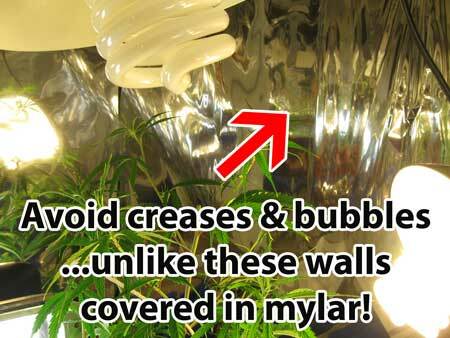 Some growers will crinkle all the aluminum foil, which can help diffuse the light more evenly. Having everything creased all over actually works better than laying it flat with just a few creases. Aluminum foil will not burn your plants like some growers claim, but there are much better reflective options out there and foil should only be used as a last resort before replacing it with something else. 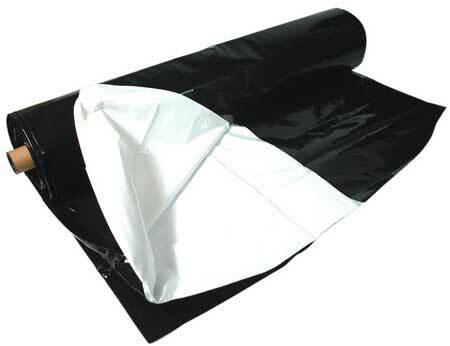 Emergency blankets are usually made of mylar, but they tend to come folded up instead of in a roll (making them easy to crease). These blankets tend to be very thin and easy to tear by accident. One of the advantages is these blankets are cheap so can be replaced often, but it is difficult to get them to lay flat against your walls. Mirrors seem intuitively like a great choice, but in reality they are "just okay" (at best) for reflecting the light of indoor grow lights back at your plants. While mirrors are great at clearly reflecting your image back at you, they're not meant for reflecting light; especially light that is actually usable to your cannabis plants. Mirrors don’t reflect light from the grow lights in optimal patterns and tend to create light/heat spots. 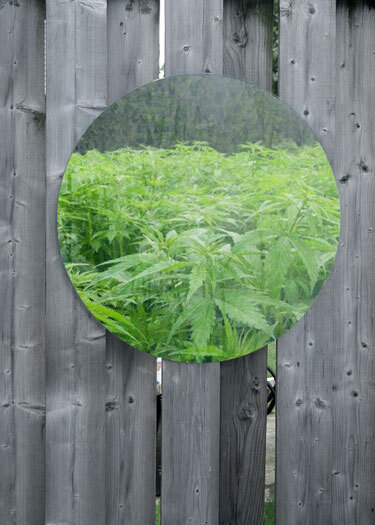 While better than a black wall, I strongly recommend not using mirrors for reflection in the cannabis grow area. Styrofoam (Expanded Polystyrene Foam) is cheap, can be purchased in sheets, is durable and doesn’t weigh much at all. You can hang them on the walls, or styrofoam sheets can even be used as a “wall” all by itself. The uneven surface of styrofoam helps diffuse light without creating hot spots. However, the pros of styrofoam are outweighed by the fact that it's super flammable! For that reason alone, I strongly recommend not using styrofoam for reflection in the cannabis grow area. Certain reflectivity options tend to hold heat in, while others tend to let heat out. Which do you need for your grow setup? Or just get a grow tent, which will contain much of the heat unless you vent it out. 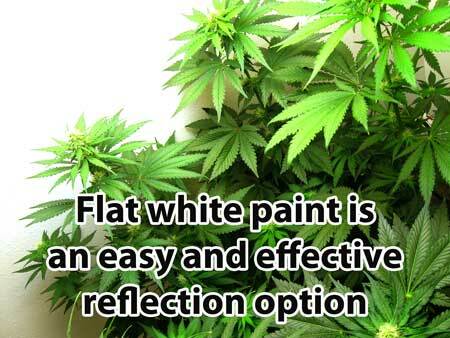 Use flat white paint on the walls of your grow space to reflect back a lot of light, while absorbing some of the heat. Paradoxically, a grow tent is also the best option for hot grow areas because they come with built-in cooling options that make it easy to set up an exhaust and gain complete control over the temperature of your grow area. Look for smooth curves in your reflector/hood if possible. 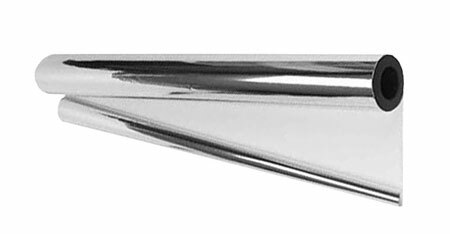 More sharp bends in the reflector will slightly reduce its efficiency. Opt for a wide reflector above your plants. Narrow or small reflectors aren’t able to bounce back as much light down at your plants. 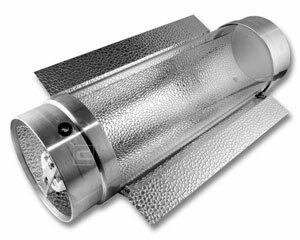 This is why small “cool tube” reflectors have limited reflection abilities compared to other types of hoods with broader faces. While the above guides will help you get the most from your grow area, one of the best ways to actually test the amount of light your plants receive is to use a light meter (also known as a lux meter). A light meter actually measures how much light is being received at a particular spot. You can use one to actually measure how much your reflective walls are making a difference to your plans! Note: While light meters are pretty good for measuring the light from most grow lights, they are not as effective at measuring light from LED grow lights. The Science: Often you'll see light bulbs measured in how many "lumens" are given off. For example, let's say a bulb produces 20,000 lumens – how do you determine how much of that light is actually being received by your plants? A light meter measures "lux," which is different from lumens, and lux is a better indicator of the amount of light received by your plants. Lux measures how many lumens are received in a specified amount of area (a lux is equal to one lumen per square meter). This is what's important to your cannabis – how much light is actually getting to your plants! Many factors will affect how many of those lumens actually "make it" to your plants such as how far the plants are from the lights and the reflectivity of your walls. While lux isn't a perfect way to measure light, it's better than using lumens. Analogy: "Lumens" are like the advertised horsepower of your car. "Lux" is like the actual top speed of your car. It's important to understand that a light meter measures the total amount of viewable light, and doesn't measure the "spectrum" of light. A light meter can't tell whether the light is in the spectrum that your plants prefer or can use. This is why it's important to get grow lights made for plants like cannabis, so you don't have to worry about spectrum. Not sure which grow lights to get? 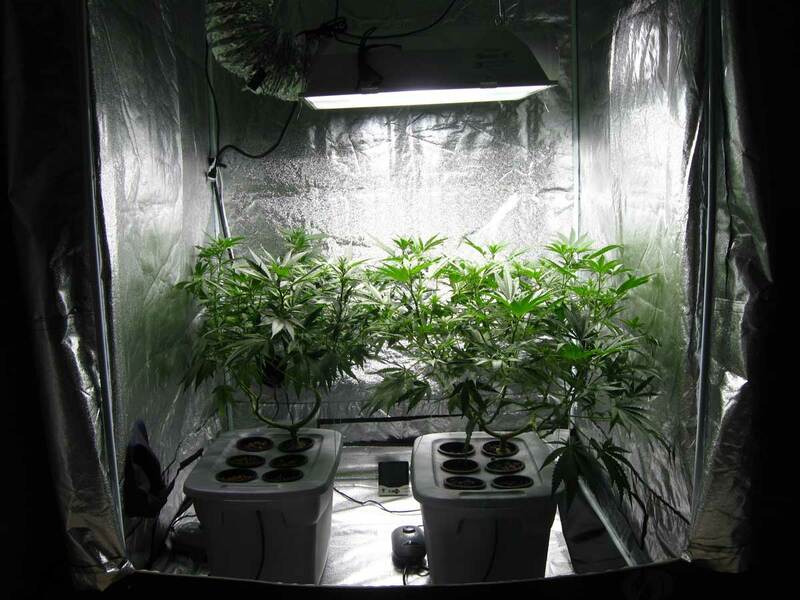 Read the cannabis grow light upgrade guide! A light meter will measure the amount of "lux" and here's a good guide to help you determine if your plants are getting enough lux. Note: The only way to increase the plant's saturation point is to supplement with CO2. Light meters will let you directly measure the change in brightness as you add reflective materials to your grow area, as well as adjust your lights so they are closer or further away from your plants to provide the precise amount of light you want. Light meters are also useful for testing new or old grow lights to make sure the bulbs are as bright as they should be. As grow lights get older, they tend to produce less light over time, and a light meter can help you decide when it’s time to change your bulbs or upgrade your grow lights. Hands-down your best option for small-scale growers (if you can afford it) is to get a grow tent which is specially made for growing plants. Get a professional grow tent with "hammer-style" textured walls if at all possible. Grow tent walls are designed to reflect back the most light that is usable by your plants, and have reflective materials on all sides including the floor and ceiling. Quality grow tents are light proof (no light gets in or out) and are designed to be hooked up to an exhaust system to easily control your heat. They are also water resistant and easy to clean. 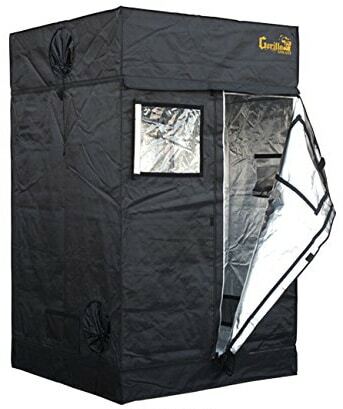 A grow tent is easier to set up and use than almost any other grow option. This is a very popular, well rated and widely used tent among hobbyist growers. This tent will help you grow sticky homegrown for years to come!